Mix Tex Mex seasoning with the turkey. Drain pineapple. Mix all salsa ingredients in a bowl. To make each salad, place 1 c. romaine in a 16 oz. bowl or clear clam shell. Top with 2 ½ oz. (½ c.) turkey. Sprinkle 2 tbsp. diced tomatoes over turkey. 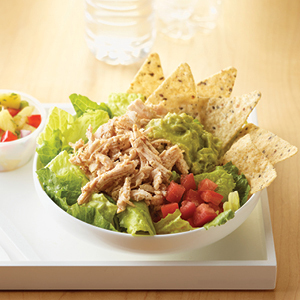 Place a #40 scoop guacamole on top. Place 1 oz. tortilla chips around the edge of salad. Serve ¼ c. salsa on side. Keep chilled at 41°F until service. 1 serving provides 2 oz. meat/meat alternate, 1 servings bread/grain, ½ cup vegetable (dark green), and ¼ cup fruit. Salt free Tex Mex seasoning 1/2 c. 1 c.
Onion, diced, ¼" 1 1/2 c. 3 c.
Red bell pepper, diced, ¼" 1 1/2 c. 3 c.
Jalapenos, diced, fresh or canned 1/4 c. 2 tbsp. 3/4 c.
Cilantro, chopped 3/4 c. 1 1/2 c.
Romaine salad mix or chopped romaine, RTU 8 lbs. 16 lbs. Tomatoes, fresh, diced 3 lbs. 6 lbs. Guacamole, prepared 1 qt. 2 c. 3 qt. Tortilla chips, whole grain 3 lbs. 2 oz. 6 lbs. 4 oz.